I got four (4) books this week! Hurrah! Shiver, by Maggie Stiefvater. I've heard good things about this book. And it's about werewolves. Who doesn't love werewolves? Rampant, by Diana Peterfreund. Killer unicorns. Need I say more? All in all I think I got a pretty good haul this week. Great mailbox. 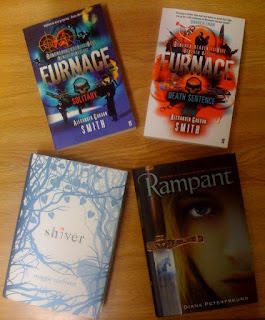 I really want to read Shiver. Shiver and Rampant are both wonderful! You got those other two ridiculously far ahead... hope they are great! I've heard a lot about Shiver, and I hope I get to read it soon. Have fun reading your new books! I just read Rampant and enjoyed it, though it wasn't a huge favorite. Hope you like it. Happy reading! Shiver is amazing! :) I hope you love it!